The 21st century ushered in the new era of drug addiction and overdose in the form of an opioid crisis. The flood of opioid use is considered a crisis because of the severity of the problem, the ease of addiction, and the fatality rate of users. Unlike other drugs that have swept across the United States, none have been so addictive, nor mass prescribed by medical practitioners, as opioids. Opiates are extremely addictive. The overwhelming euphoria and relief from pain intensifies the lows when a person is not under the influence of them, making them intensely psycho-addictive. Opiates cause a very quick chemical addiction by altering the chemical makeup of the brain. The cycle is incredibly difficult to break. And, because opioids are prescribed for pain management quite regularly, it can be difficult to identify what is regularly prescribed use and what is misuse or addiction before it is too late. Opioids, unlike many other drugs, can cause death on the first use and the potential for overdose increases exponentially as tolerance builds and the user must use more, more frequently. Opioids are a depressant, which can have a powerful effect on the brain and respiratory system, many overdoses cause the user to simply stop breathing. 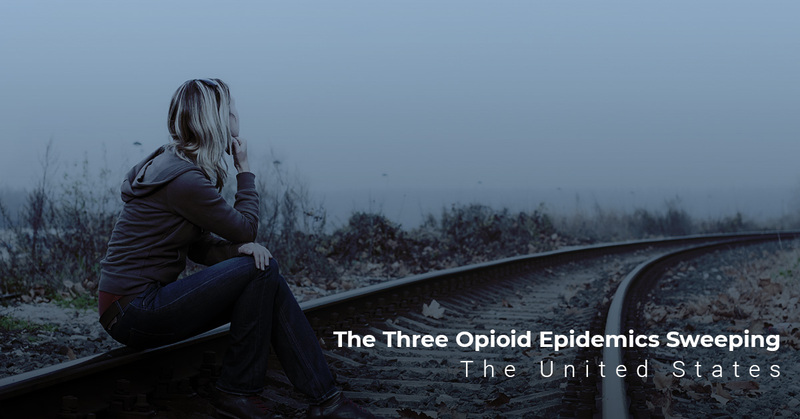 In today’s post, we will compare the three different opioid epidemics and why each is a grave concern. 2.1 million Americans are currently suffering from opioid addiction disorders. Approximately 70% of the more than 70,200 drug overdose deaths last year involved an opioid. On average, 130 Americans die every day from opioid overdose. Opioids make up the majority of prescription pain medications that are used in a variety of settings including trauma, cancer treatment, and chronic pain conditions. There are more than 214 million active prescriptions for opiate pain medications at any given time, 11.4 million of which are misused. While millions of people use prescription opioids for acute pain related to surgery or trauma, millions more use it as a long-term pain management option. Unfortunately, nearly one-third of prescriptions are misused. Because opiates are so addictive, many people who misuse their prescriptions suffer addiction and nearly one in ten turns to stronger opiates, including heroin or illicit synthetic opiates. Last year, prescription narcotics claimed the lives of nearly 48,000 Americans and resulted in more than 2 million addiction problems. Heroin has caused widespread addiction that continues to grow over the last 20 years. 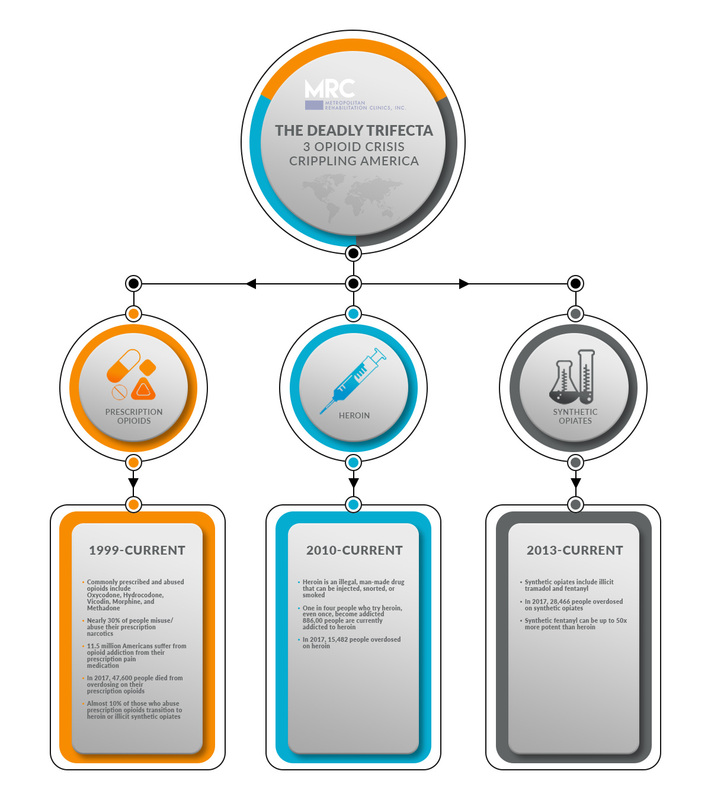 Heroin has evolved from being a cheaply made drug that was popular in the drug addict population, to being a commonly used drug across all classes and walks of life. It is so commonly addictive, that 886,000 Americans currently suffer from a heroin addiction. Heroin is a highly addictive opiate that causes a euphoric high that is hard to match in real life. Because it quickly changes the chemical makeup of the brain, it can result in severe withdrawal symptoms and cause a user to have changes in thoughts and behaviors, even when no longer under the influence. Because of the respiratory depression, it causes and the quick tolerance level users develop, accidental overdose is fairly easy. So easy, in fact, that last year, nearly 16,000 deaths we caused by heroin in America last year. Synthetic opiates are made both for use by medical professionals and illicitly to recreate prescription medications for use outside of prescription. Fentanyl is the single most common synthetic opiate that has been used to make patches and is injected. A major problem with this is that synthetic fentanyl can be up to 50 times more potent than street heroin. As you can imagine, this increases the risk of overdose and death dramatically. In fact, in 2017, 28,466 people overdosed on synthetic opiates, which is almost double what was caused by heroin. At Metro Rehab, we have been helping the people of Detroit and the surrounding areas fight addiction with proactive addiction recovery services and long-term sobriety solutions. We are dedicated to helping addicts overcome their addictions and live a long, sober life.